Irrigation can be an easy and effective way to water your crops with minimal labor. From small sprinkler systems to elaborate drip tape systems, there are many irrigation options available for hobby growers and commercial growers alike. The three main types of irrigation systems available from TekSupply are drip tape systems, dripper systems and sprinkler systems. What is a drip tape system? A drip tape system is a form of irrigation in which high-quality polyethylene tubing with emission outlets built in every 12" is placed along rows of crops to water them on a schedule determined by the grower. Drip tape systems let out only small droplets of water at a time, to water specific places rather than providing a steady stream of water like sprinklers or a hose would do. The drip tape, which is placed along rows or buried underground, is attached to a ¾" polyethylene tubing supply line by barb connectors. 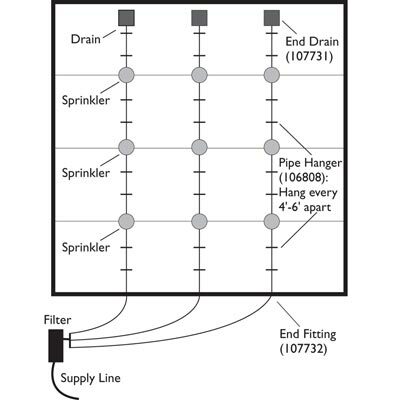 Attached to the supply line is a hose bib assembly, depending on the size and complexity of the system you plan to install. At the end of each drip tape line, an end plug should be installed to prevent water from leaking out. The operating pressure of the drip tape system should be no more than 10 PSI. 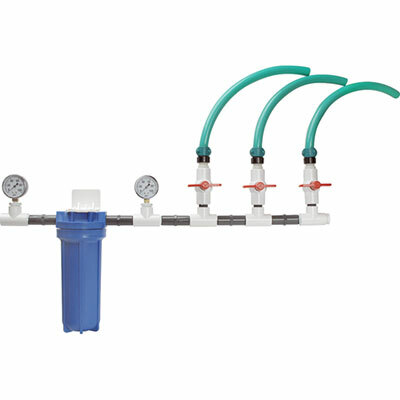 A pressure regulator built into the hose bib assembly, which is attached to the greenhouse or other structure, can decrease the pressure from the water source before it reaches the drip tape. Drip tape and the supply line can be left in or on the ground all season long, but should be removed before winter to prevent any damage from the cold and ice in areas with colder climates. When should I use a drip tape system? 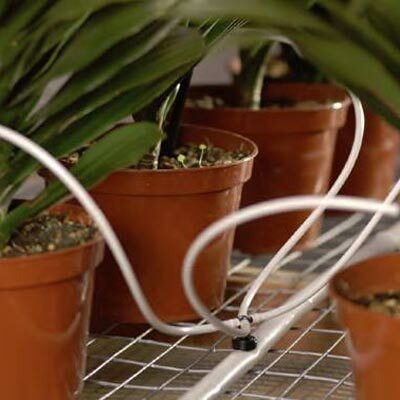 Drip tape systems are ideal when plants will remain in one place until they are fully grown. When growing row crops, drip tape systems are a good irrigation choice. They should only be used in situations where at least one emitter can be used for every plant. What are the benefits of using a drip tape system? Drip tape systems are great for water conservation because they provide plants only the amount of water they truly need. With other types of watering, much of the water misses the plants' roots and seeps into the ground or evaporates into the air unused. This type of irrigation results in uniform, high-quality crops because all crops receive the same amount of water. By providing only the necessary amount of water, weed growth and the spread of disease are decreased as well. Disease can be spread by water sitting on leaves of plants. With this method of irrigation, no water should hit the leaves because the drip tape applies it directly to the roots. Another advantage of drip tape is that it can accurately deliver herbicides and pesticides to plants which can help stop the spread of disease and insects. Besides these helpful growing aids, drip tape can also deliver fertilizer to crops. This precise and efficient method of delivering water and nutrients to plants will result in faster growth rates and earlier harvests, meaning you can bring your crops to market earlier. What is a dripper system? A dripper system is much like a drip tape system in that it distributes little droplets of water directly to the roots of plants on a schedule when the system is equipped with a timer and solenoid valve. The difference between these two systems is that drip tape has built in emitter holes every foot in the tape itself, while dripper systems are more customizable with many types of drippers available for different purposes. The drippers are attached to a somewhat rigid poly tubing by punching holes at your desired intervals and inserting the drippers. When should I use a dripper system? Dripper systems can be used for tree, vine, permanent row crops and greenhouse and nursery applications. Depending on your application, the type of drippers you need may vary. If you are trying to water hanging baskets, weighted drippers may be used. These drippers can be turned on and shut off so that all baskets can be watered at once, or just a few will be watered. If dripper lines are more than 36" long, TekSupply's Woodpecker PC dripper should be used. 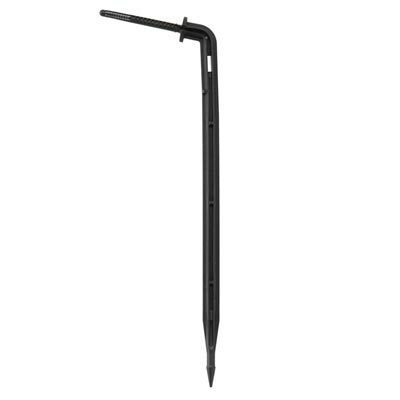 Angled Arrow Dripper Stakes are another efficient way to water potted plants. By placing the stakes in each pot, water is applied directly to the root of the plant. 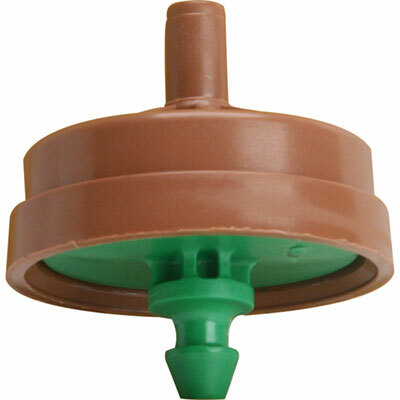 If you have only a single line, the Angle Barbed Dripper Stake can be used to direct water into the plants' container. By using the dripper systems with manifolds, field irrigation becomes easy. Simply attach either a two or four-way manifold, depending on how many drippers you need. Manifolds are low-profile and durable, minimizing damage from field workers. What are the benefits of using a dripper system? Dripper systems provide a way to evenly and efficiently water potted plants, row crops and greenhouse and nursery plants. Due to the fact that water and fertilizer are applied in equal amounts at equal time intervals, regardless of where a plant is located in the row, the result is highly uniform crop quality. Unlike other irrigation systems, drippers include a built-in check valve to prevent back flow and draining at the end of the cycle. Since drippers adjust themselves based on line pressure, water distribution is 94% uniform even when the plants are on a slope. Much like when using drip tape, water is applied directly to the roots, preventing water on the leaves which can spread disease. This also reduces water waste and prevents pesticides from being washed off, resulting in less water use and less frequent pesticide applications. What is a sprinkler system? A sprinkler system allows you to water a large area at once. Not only is this system an efficient use of water, but it is also very convenient because it allows you to control which areas are watered and when. The system is divided into circuits running from the main water supply, which each have their own control valve. These are then operated by an electronic controller which activates according to the time settings you choose. Where can you use a sprinkler system? 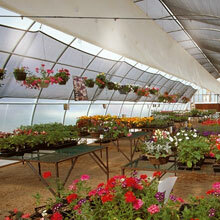 Sprinklers can be installed inside a greenhouse or high tunnel to provide semi-automated watering of your crops. They can also be used in fields, gardens and yards. Sprinkler systems can be customized to water only a few crops with one sprinkler head, or to water entire fields with a series of sprinklers. What sprinklers systems does TekSupply offer? Our 3-Zone Sprinkling System is a cost-effective option that is easy to use. It is ideal for overhead watering and ensures adequate watering conditions, eliminating the concern of over-watering. The system works through zone watering with up to three sprinklers per zone. Each Sprinkler Assembly will efficiently water a 30 to 35 ft. space with a recommended pressure of 40 to 50 PSI. 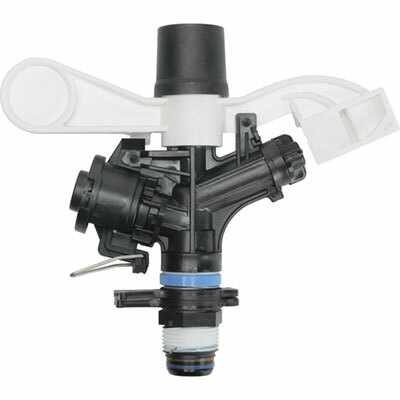 Add a Rotor Max Inverted Sprinkler Assembly, End Drain and End Fitting to customize the system to your exact needs. We also offer Senninger® Impact Sprinklers which are constructed from engineering-grade thermoplastics for strength and durability. Impact sprinklers are an effective form of irrigation because their design creates uniform water distribution which closely resembles the effect of natural rainfall. We recommend our Brute Sprinkler Stand for use with the following impact sprinklers. All are guaranteed with a 2 year manufacturer's warranty on materials, workmanship and performance. The ¾" Part Circle delivers maximum efficiency at low to moderate flow rates for agricultural, horticultural and industrial applications. These are also ideal for dust control and suppression. It distributes water in a 60° to 360° pattern at 5° increments. The ¾" Full Circle is ideal for a wide variety of applications due to its large diameter of coverage and its ability to handle high flow rates. These are designed to have a maximum throw on overhead systems. The 1" Full Circle is capable of distributing water over a large diameter making it ideal for a higher volume system. This sprinkler has a built-in hex wrench for easy maintenance. 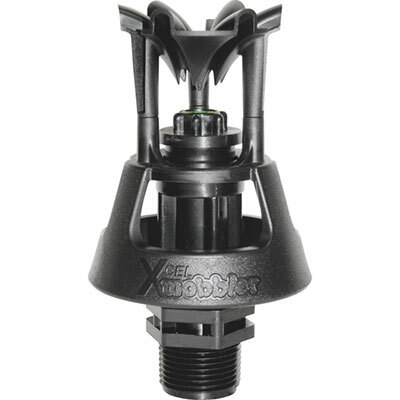 We also carry Senninger Xcel Wobbler Head Sprinklers. 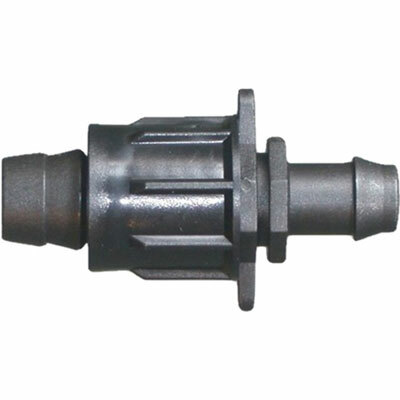 These feature unique off-center rotary action, providing extremely uniform coverage at low pressures with minimal evaporative loss. Their high-angle design produces droplets which resist wind drift. Their color-coded nozzles of Turquoise, Red or Blue identify either #10, #12 or #14 orifice size, respectively. Rapid Rain Sprinkler Systems are another option that we offer. 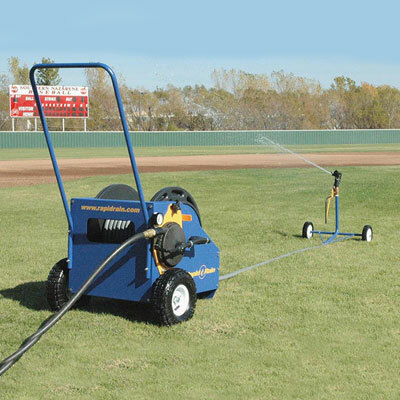 These are the best water-powered, automatic systems on the market and are ideal for a wide variety of applications including yards, riding arenas, gardens, parks, schools and more. The Rapid Rain 625 is compact, easy to maneuver and comes with 100 ft. of hose, making it ideal for smaller areas up to one acre. The Rapid Rain 860 is perfect for larger areas including commercial applications and comes with 200 ft. of hose. Both of these models are completely powered by water and attach directly to a standard garden hose. Their special features include automatic retraction and shutoff, part or full circle operation settings and easy speed control. Our Adjustable Hi-Rize Sprinkler Systems are designed to take the work out of watering and allow you to safely reach tall plants and shrubs. They are constructed from a long-lasting, lightweight aluminum frame with a fitting that connects to any garden hose. 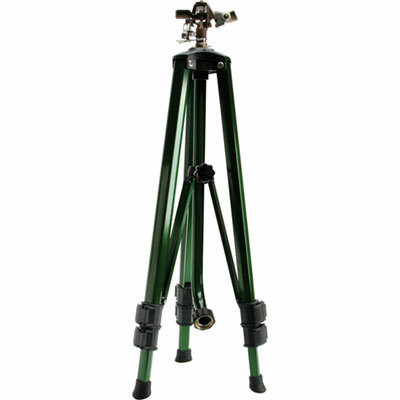 This tripod sprinkler is extremely portable, and folds down easily for moving, carrying and storage. There are two adjustable heights to choose from  up to 41" and up to 71". TekSupply's line of misters and emitters are perfect for intermittent cooling of your greenhouse plants. 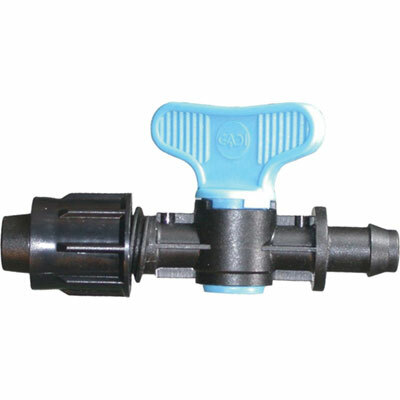 We offer two adjustable flow sprinkler emitters for 180° or 360° watering. There is also a Droplet Emitter available for another drip irrigation option. For a simple misting action, we recommend the Mister which will lightly spray your crops when desired. Have questions? Visit Live Help or Contact Us.